Product Use : Liquifilm tears is a lubricating eye drops for dry eye conditions. Liquifilm Tears eye drops soothe and lubricate dry eye/s and provide greater comfort and longer wearing time of hard contact lenses. Do not use with soft contact lens. 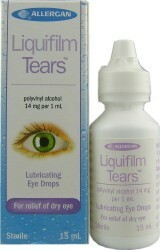 Use one drop of Liquifilm Tears in the eye/s as needed or as directed by the Pharmacist or Doctor. If irritation persists or increases while using Liquifilm Tears , discontinue use. Keep the container tightly closed and do not touch the tip on any surface as this may contaminate the solution. For external use only. Discard any unused portion of Liquifilm Tears 4 WEEKS AFTER OPENING.